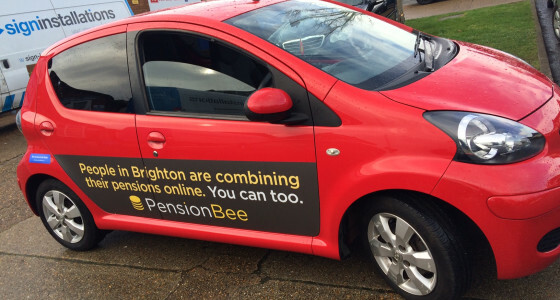 PensionBee is using 20 car owners in Brighton to advertise their revolutionary online pension platform. The campaign gives PensionBee customers and Carquids members an opportunity to earn extra cash, by simply branding their cars with PensionBee car wraps. Drivers travel around as they normally would but earn cash for each trip they make, with each journey advertising the PensionBee brand to potential new customers. Research from Carquids in July last year revealed that almost 1/3 of the Carquids community preferred technology brands on their cars instead of mainstream brands. If the pilot is a success in Brighton the company is planning to select more UK drivers to advertise its online pension product. About PensionBee PensionBee is an online pension manager that lets you combine your pensions into one online plan. Customers can manage their pensions on their phone, see their balance 24/7 and make regular or one-off contributions. About Carquids Carquids is a marketing startup that specialises in wrapping cars with branded advertising. After launching two years ago and bringing on board 5,000 drivers in their first year alone, they’re shaking up the way businesses advertise themselves.